18th & 19th March 2013, The University of Sheffield. The research findings established through this Industry – Academia partnership interrogated the fundamental green roof understanding of the current age. 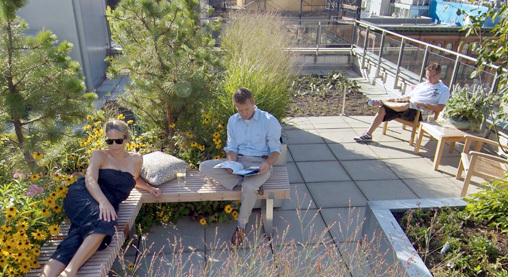 The very performance metrics by which green roof elements are measured were questioned, the outcomes demonstrated that new research agendas should be adopted. In addition, leading scientists from the most innovative green roof research centre's around the world presented their leading edge investigative activity. Speakers included Ed Snodgrass, Emory Knoll Farms, Maryland, USA; Claire Farrell, University of Melbourne, Australia; Professor Nigel Dunnett, IAPP Project Coordinator, University of Sheffield; Dr. Robyn Simcock, Landcare Research, New Zealand; Dr. Abigail Graceson, Harper Adams University College, UK; Mr Ralf Walker, Division Manager Research and Development, ZinCo GmbH. ; Daniel Roehr, Associate Professor. University of British Columbia, Canada; Dr. Anna Palla, University of Genoa, Italy and Dr Virginia Stovin, University of Sheffield. Research topic areas include plant selection + screening; Optimised hydrological performance (both, vegetation establishment and stormwater) and Integrative whole system hydrological modelling. The conference was intentional programmed as a single stream of presentation to emphasise the importance and impact of each consideration of green roofs. The conference was well attended by a wide range of delegates, from those with a general interest in green roofs, to those with particular research agenda in plants, substrates design and function, manufactured layers and their interaction with water and stormwater management. 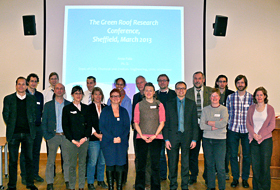 This truly was the opportunity to be in at the beginning of the new age of green roof science.